Yes. Call (888) 306-5238 for information about our company and to reach your local representative. Why have steel instead of wood? There are several reasons to use steel instead of wood. The first one is, steel buildings go up quicker allowing the customer to move in, in less time. There's less waste in material, saving the customer money. 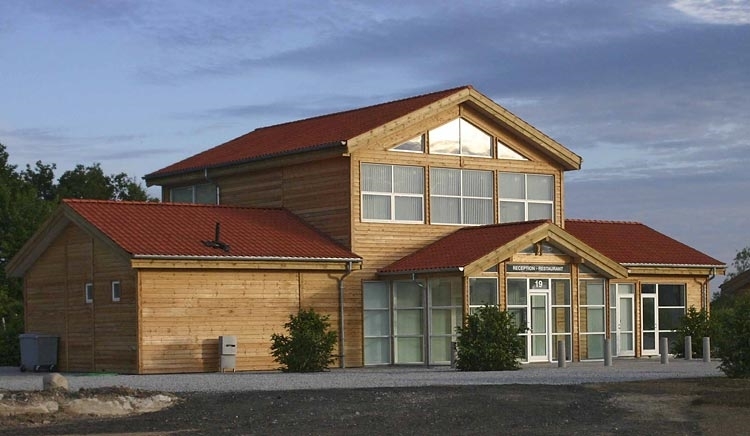 Steel buildings are also based on recycled material which help meet users' eco-friendly objectives. We have frequent electrical storms here and I'm nervous about the idea of being in a steel structure. The odds that lightning will strike your building are extremely low. However, if it does happen, you are probably safer in a steel structure because steel framing channel lightning strikes to the ground, much like a lightning rod does. This type of direct path to the ground helps prevent the lightening from causing secondary hazards such as fires or explosive splintering (which happens to trees and wood). All the parts you need to assemble your building are included except for the anchor bolts (your concrete contractor will supply these). 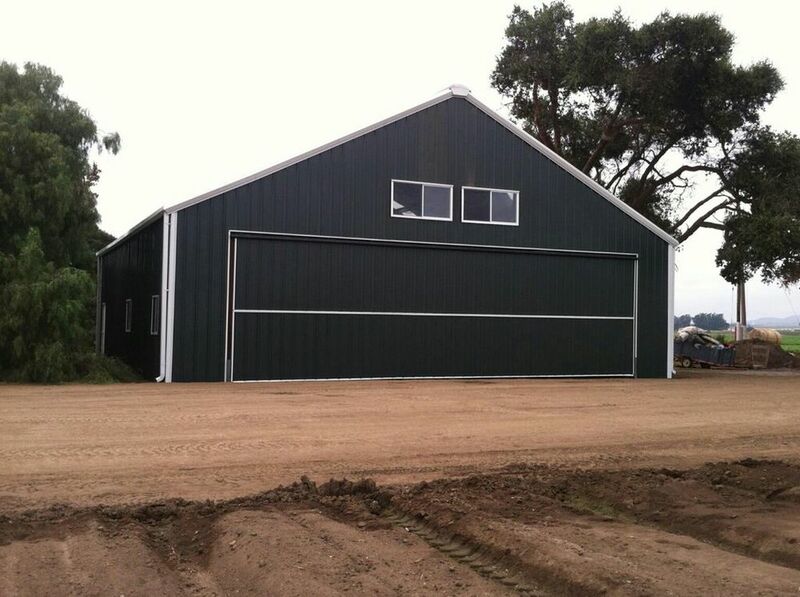 These buildings reduce the amount of field cutting and field welding typically found in conventional framing. How long is the sheeting guaranteed? We have a 25 year limited paint warranty (except for "crimson red" which is warrantied for 5 years, however the galvalume underneath is still warrantied for 25 years) . Do you have kynar finish? Kynar paint is available as a special quote item. Our standard coating for buildings that are priced online is siliconized polyester for all colors except polar white, which is pure polyester. All except crimson red (which has a 5-year warranty) are covered by our 25-year paint warranty. We have kynar finish options for both our Commercial and Architectural panels. Selection of kynar color depends on panel profile (type). 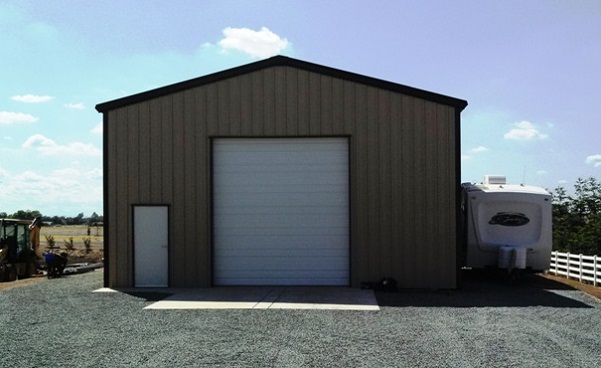 Do you have any special buildings sizes that are considered mass-produced and are less expensive? All of our buildings are inexpensive, and there is really no such thing as a "mass produced" building size. Size is only one of the considerations when engineering a building. Because of the combination of other factors that must be taken into account -- for example, wind loading, wind uplift, snow loading, seismic rating, and the number, size, and placement of openings to name a few -- almost every building is at least slightly different from all others. Some suppliers will advertise pre-priced buildings, but until they know all the engineering factors and the shipping distance they cannot determine an accurate cost. I'm looking for a building smaller than 30 feet wide. Can you help? 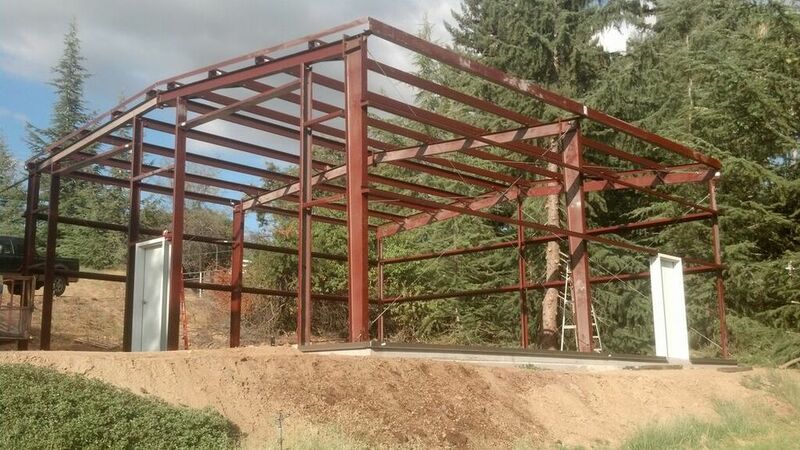 Unfortunately we can not, we sell a rigid frame metal building, anything under 30' is cost prohibitive. It does not serve our customers to offer anything smaller. Our minimum size is 30' x 30'. Are the bolted structural connections pre-drilled or punched, or do I need to burn holes and bolt or weld all the clips on? All our structural members are pre-punched, and all our connecting clips are already welded in place according to our engineering specifications. This is not the case with many buildings sold. Most come with loose clips which must all be bolted on to the members, requiring a great deal of extra labor and time. Having said all that, we should still point out that erectors frequently have to burn a new hole or two when putting up a building. Among the tools we recommend that an erector have is a cutting torch. We also urge that you call us before making even minor modifications to your building. Never make any modifications to your building without consulting our technical support personnel. Our buildings are precisely engineered to meet specific code and load requirements, and modifications may compromise their structural integrity. SIERRA BUILDINGS will not knowingly aid, agree to, or participate in any way in the construction of a structure that does not meet all applicable code requirements. What is the spacing on purlins and girts? Generally, the first girt is at 7'4" and girts above that are usually at 5 feet (depending on design specifications). Depending on wind loading, there may also be a girt below 7'4". Purlins are typically spaced five feet apart, but with high roof loads this interval will narrow accordingly. On the sidewalls are the girts flush or outside the post? Our system standard is bypass sidewall girts (outside the post)and flush end wall girts (inside the post). Bypass sidewall girts are used due to the size of the bays, allowing to maintain cost effective design. Alternate configurations are available upon request. What is the weight of the roof structures? The roof structure consists of the rafters, purlins, brace angles, sheeting, and fasteners. The weight can vary greatly depending on the loading requirements. Most customers asking this question are concerned about unloading the material from the delivery truck. We limit our load bundles to a maximum of 3000 pounds. Most bundles are 1200 to 1700 pounds. After you purchase a building and check on availability of a forklift and/or crane, if you need a specific weight limit on the bundles, in most cases we can accommodate you. Do your gable ends and/or eave of the roof come with a closure to keep out varmints? Yes. Our roof systems include trim material, mastic tape, and closure strips that, when properly installed, not only create a barrier against birds and other varmints but provide an effective weather seal. Obviously, every stage of construction is important, but it is particularly important that erectors take their time and install this system correctly. It will be the difference between a leaky building that is prone to rust and mildew and a weather-tight structure that will stay snug, warm, and withstanding for years to come. How long does it take for moisture to damage sheets that haven't been installed? Most problems occur when sheets are left bundled for several weeks, but there is no reason to take chances. When we send drawings, we include instructions on how to care for bundled sheets, and it is important to read and follow those procedures. Do you sell standing-seam roofs? Yes, we can provide standing-seam via special quote. To do this, you will need to contact your local representative. We have several types of standing seam roofs including hand crimped and machine seamed. Yes, you can. To do this, you will need to contact your local representative. We also offer overhangs with soffit panel to make it more aesthetically pleasing. Can air conditioners be mounted on your roofs? We can provide point loads on the roof if you can tell us the weight and other pertinent information about the air conditioners. To do this, you will need to contact your local representative. How do I order a building with no sidewalls? Yes you can specify open wall conditions. Can I order a building with Galvalume Plus® finish on the walls, trim, and door as well as the roof? We have a 25 year limited paint warranty ([PDF format] except for "crimson red" which is warrantied for 5 years. Which base trim option should I choose? Sierra Buildings includes a one piece Deluxe Base trim as standard with it's buildings. There are several other options available, please consult with you Sales Consultant as to your options and the conditions required. All the parts you need to assemble your building are included except that we do not supply the anchor bolts for rigid-frame commercial buildings. The relatively large anchor bolts for this type building are usually set when the slab is poured, well before the building arrives. Anchor bolt size, installation, and the Anchor bolts are the sole responsibility of the foundation contractor or the owner. .
Do you use stainless steel screws? No, our standard screw is a Zinc alloy long-life fastener, which is superior to stainless steel in this application. We guarantee them for 20 years. Our roof fasteners have a Zinc-Aluminum alloy head and carry a lifetime red-rust warranty. What size are the connecting bolts? This depends on loading, but the average bolt is going to be ¾ inches or less in diameter. How many windows do I need for light and ventilation? This is a matter of personal preference. In general, our customers tend to purchase 2 windows per 2400 square feet of building space. See the section on Windows for more information. Do you offer insulated windows? Our walkdoors include framing, but they do not come attached to it. They are what are called "knockdown doors." They come with a frame, hinges, threshold, and standard knob lockset or lever lock. See the section on Walk Doors for more information. No, walk doors are "field located." For more information, see the answers to the following two questions. How do you know where the walkdoors and windows go? Walkdoors and windows are "field located." This means that the customer picks the location, cuts the panel and mounts the walkdoor or window. If a customer purchases a large number of walkdoors and/or windows, we will inquire as to the proposed location so that we can conduct a wind bracing evaluation. Most customers only select one or two of each, so this is not generally a concern. What do the walkdoors and windows attach to? Walkdoors are "self framing," which means they include the framing, trim, and flashing you will need to frame them in. For an additional charge, we can provide a sub-frame for the walkdoor frame, or we can design factory-located openings for them, but most customers do not require any additional framing. Windows are "self flashing." This means that the window trim (flashing) is secured to the building by screwing it into the wall panel. Windows do not have a frame, but we can add a cee channel sub-frame for an additional charge. For customers in areas where the sustained winds can exceed 99 mph, we recommend purchase of a sub-frame. Can I install regular wooden doors in the building? That could be a big mistake. Residential doors are designed for a totally different type of structure and will simply not fit your steel building. For one thing, they are made for a 6" jamb, but our buildings need 8". They will also not trim out or seal properly. Trust us, this is not a good way to save money. What is the R-value of your fiberglass insulation? The R-value depends on the type of insulation and the thickness. In general, 3-inch insulation is R-10, 4-inch insulation is R-13 and 6-inch insulation is R-19. For more information, see the section on fiberglass. What is radiant barrier, and what is its R-value? Briefly, it works on exactly the same principles that allow a thermos bottle to keep hot coffee hot and iced tea cold. For a full description, see the section on reflective foil. What is a roof jack? Roof jacks, also known as "pipe flashing" are used to provide a seal around anything projecting through the roof (exhaust pipes, etc.). They consist of a flexible EPDM rubber collar attached to a flexible metal base. They can be cut to fit different sized pipes. Is the bottom of the 9-foot long ridge vent die formed? Our standard vent is not die formed, but the flat panel is designed to work with our roof panel. We have not had any complaints with the attachment. There is an optional die-formed vent which is 9 inches x 10 feet. We do not sell wood studs or sheetrock for finishing out the interior of the building. Standing inside the structure and looking at the walls, you will see the red-iron main frames, red-iron girts, and the back side of the wall panel which will be white (all wall panels are white on the back except for galvalume panels, which are a silver color on both sides). Of course, if you install a vapor barrier, reflective foil, or fiberglass insulation, the facing of this material will cover the wall panels. Can I add a steel interior liner to my building? Yes, we offer several liner panel options, depending on customers interest. I don't need a building, but I do need sheeting and screws to repair a building I own now. Are these types of items included in your components section? Also, I need a walkdoor but don't want to have to buy a new building to get it. Right now, we can take component orders through our special quote system. What brand doors do you sell? We offer doors and accessories by Clopay, and DBCI. What comes with the doors? The standard door system includes the door, the tracks and rollers, torsion springs and other door hardware, e.g., an exterior handle. Some larger doors include a chain hoist while smaller ones do not (however it could be added as an option on the smaller doors). In most cases yes but not always. 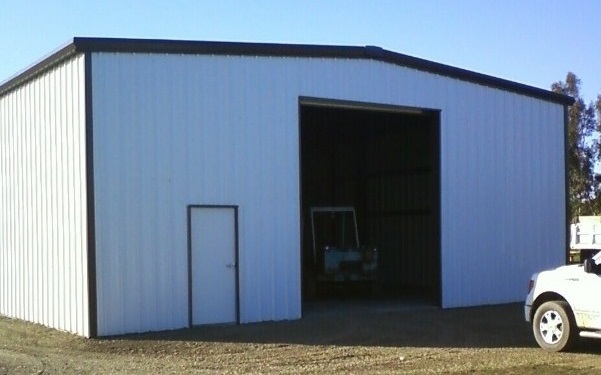 For example, in some locations no permit is required to erect agricultural buildings. However, we have no way to know for sure, and you will have to answer that question yourself. You should definitely check with your local building inspector before buying a building from us or anyone else. When I call my building inspector, what should I tell him or ask him? Fax or take the entire contract to the inspector. Unless the inspector requires permit drawings, this contract should give the inspector the information he needs to determine if your building will meet code. What if I need permit drawings? We cannot release complete plans until you actually commit to buy the building; however, once you do commit you can choose the "hold for approval" option. When we have received your deposit (immediately if you pay by credit card), we will prepare and send one or more sets of "permit drawings" that you can submit to your inspector, and we will not begin fabrication until you get the necessary permits. What if my inspector requires that my drawings be stamped or sealed by an engineer? What if they require design calculations? We have engineers on retainer who are registered in every state. You will be able to request that your drawings be stamped or that we also provide design calculations (sometimes called "calcs") which some inspectors will require.